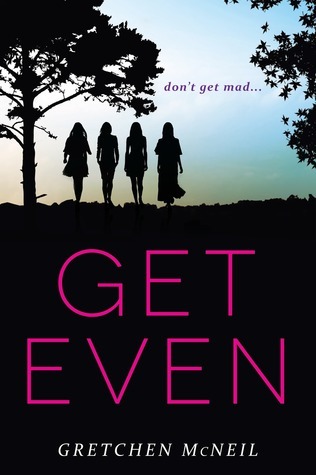 Get Even is the first in a new series by Gretchen McNeil, author of Ten, 3:59 and Possess. The book is very dynamic and tightly plotted – the story itself is well thought through, and the mystery is almost impossible to solve ahead of time. There are many clues and probably red herrings, but not enough to come to any sort of conclusion about the culprit. The problem with having four very different point-of-view characters is that it’s hard to form any kind of emotional connection with them. Each of the girls has her own agenda and they are often secretly, or even unknowingly, in conflict with each other, but it’s impossible for us to choose sides since the narrative is divided pretty equally, which also makes it difficult to actually care about the outcome. If anything, every one of these girls is pretty unlikeable at times, and while their initial goal is noble, their overall behavior isn’t commendable in the least. The lack of characterization and proper emotional connection was most likely intentional - meant to plant a seed of doubt into our minds. We were supposed to question the girls' actions, alibis and motivations. Any one of them could easily be the murderer. (We still don't know for sure, of course.) In addition, most of the romances were a bit superfluous, nothing more than an unnecessary burden on the narrative. But even that’s something a more patient reader can easily live with. The biggest issue with Get Even is that it ends with what is basically a cliffhanger. We learn nothing about the murderer(s), nothing about the fate of our protagonists, and not a single thing is actually resolved. The book just ends at a certain point, and while the ending is fairly memorable, it also feels a lot like cheating. The next book is probably worth picking up, but with caution and a noticeable lack of enthusiasm. Let’s see where it all goes, shall we? We could end up pleasantly surprised. Ah yes it's a little difficult when you can't link with any of the characters, at the end you're a little out of the story. But it's interesting to see that the book has a good mystery, I love that. I didn't know the book so thanks for the review. I hate these kind of endings. I don't like unresolved ones. I haven't read any of McNeil's books but they have pretty interesting premises. I like that the mystery in this one is hard to solve, but it's too bad that it's hard to form an emotional connection with any of the girls, which is why I usually avoid books with more than dual POVs. Thanks for you review, Maja! I think we felt very similar about this Maja. It was good but not great but at the same time the mystery was well done. Despite the flaws you mentioned, I was still interested since you said it was difficult for you to figure out the mystery, but that cliffie sounds like more than I can handle. "The problem with having four very different point-of-view characters is that it’s hard to form any kind of emotional connection with them." That's exactly why I tend to struggle with books that have more than a dual POV Maja! I just can't connect to so many different people because I simply don't have the time to really feel them out. I could probably look past that though if the murder mystery was something special, but the fact that we reach the last page without having learned a single thing is really frustrating. I'll definitely be waiting until book 2 is out to see if I want to give this one a go! I have yet to read a single thing by Gretchen McNeil, but I have heard some positive things about her other books. So I may have to start there first and try this series when the second book is about and there is maybe a stronger feeling as which direction the series is going in. Especially when the four girls are not that likeable, I always find myself disengaging from reading a book when the main characters are not likeable. Great review! I don't think I would appreciate all the POVs and not being able to connect with any of the characters. That's so important to me when it comes to books. At least the plot is tight though. For now, I'll be skipping this. I think this will be a pass for me. I get what she's trying to do with the four POVs but that can quickly get muddled. While I liked that this mystery is thought through and not easy to solve, I'm dubious about the multiple POVs and the cliffhanger ending. I guess I'll see what book 2 is like before picking this one up. I'm really not a fan of cliffhanger endings and especially in mystery novels, I like closing the book knowing how the murder was committed and by who. I doubt this is for me but I definitely hope the sequel is worth the wait and agony of a cliffhanger! I am all for a good solid mystery that is practically impossible to solve, but a cliffhanger and lack of connection out me off. I will watch for the sequel before deciding. No. Just no. I hate books that resolve nothing. It makes me wonder if the next book will resolve anything either. I'm also not a fan of the multi-POV. I suppose though, if the next book rocks I would read it. This book has been getting os many mixed reviews but just that fact that this ending resolves nothing and it's just open is a definite feal breaker for me. I can't stand stories like that. I also just get too annoyed and it taints the entire book. I think I might have put up with anything until you mentioned that nothing really gets resolved in the end. I mean a good mystery is sometimes all I need but if I read a book, even if it's the first in the series, I want some sort of resolution. If there is none, then it just seems like I wasted hours reading a book and that is NOT cool.